We are a customer focused, document destruction company. We promise you will get great service, at a great price. Shredding Services Near Me Promise:" When you contact us about your shredding needs we will be friendly and helpful." Even if you have a simple question we would love to hear from you. We offer business shredding or residential shredding. We offer all shredding services including mobile shredding, meaning we likely have a shredding truck in your area every day. We are happy to schedule a stop at your storage unit, home, office or wherever. Let our Mobile Paper Shredding Company Help You. Shredding Services Near Me is a mobile shredding service meaning we come to your home or office & shred everything right there! "This is a genuine what you see is what you get shredding deal! 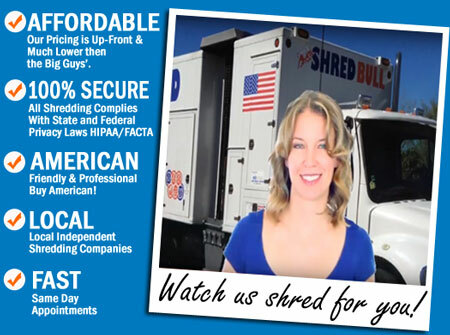 Lowest priced shredding is just a click away. " When you fill out our contact form we will give you our lowest price(usually within an hour). We'd love to help you shred. The more you have the lower the price per box. No added fees or service charges.Fill out the form today to lock in the lowest pricing currently available in your area. Since 1990 secure document destruction (paper shredding) has been the most efficient way for you to protect your confidential documents from identity theft. We are mobile meaning we come to you and shred while you watch. Same day appointments & we'll beat Shred-It's pricing, guaranteed.